Mailman is an open-source alternative to commercial mailing list managers and it’s administered through an accessible web-based interface. This course will show you how to administer and operate Mailman, and start maintaining subscriber lists of your own. Author David D. Levine covers navigating in Mailman, configuring replies and notifications, adding and removing subscribers, and setting up the interface where subscribers view their list options. He also covers adjusting privacy controls, moderating posts, controlling archiving, and managing lists via email. I’m an OWC Writing Contest “celebrity judge” — deadline 6/22! I have been invited as the “celebrity judge” (?!) for the Fiction First Chapter category of the 2015 Oregon Writers Colony Writing Contest. The contest is open to both OWC members and nonmembers, regardless of state or national residency, and the deadline to enter (electronic submission or postmark) is June 22, 2015. Cash prizes will be awarded in each category! See http://oregonwriterscolony.org/writing-contest/ for more information and the entry form. Good luck! 06-16-2015 at 06:16 AM Comments Off on I’m an OWC Writing Contest “celebrity judge” — deadline 6/22! As you may recall, my “Venus noir” story “The End of the Silk Road,” set in the same universe as “The Wreck of the Mars Adventure” and my forthcoming novel Arabella of Mars, was selected for The Year’s Best Military SF and Space Opera. Well, the anthology is now available! You can get it from Powell’s, Amazon.com, and everywhere else books and ebooks are sold. To celebrate the release, the Baen Free Radio Hour podcast is offering an interview with the editor of the anthology and several of the contributors, including Matthew Johnson, Derek Kunsken, Linda Nagata, and Michael Z. Williams as well as myself. You can listen to the episode here, or download the MP3 here. 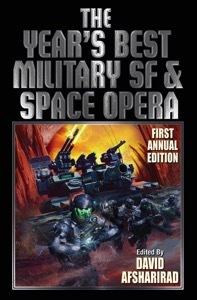 Been is also trying something new with this first annual Year’s Best Military SF and Space Opera — it is not only an anthology but also the shortlist for the first annual Year’s Best Military Science Fiction and Space Opera Award, which comes with a plaque and a $500 prize. And the winner will be selected by you, the readers! You can vote online here (or, if you prefer, you can send your vote by mail to an address found on that same page). Voting closes August 31, 2015; the winner will be announced at DragonCon. Last month I traveled to Southern California to record two more video courses for lynda.com, the online training company. It was an enjoyable experience, as always, and I’m pleased to say that both of the courses will be released this month. SED is the one of the original command line tools for parsing and transforming data on Unix, Linux, and Macintosh machines. David D. Levine helps you unlock the power of SED’s compact syntax in these lessons, which cover extracting, transforming, and manipulating data in files and data streams. He reviews the basic commands, including one you’ll never want to forget, and shows how to work with regular expressions. The course also covers SED’s more advanced programming features, which allow you to write simple programs and manage multiline pattern space, flow, and the hold buffer with a few simple keystrokes. Start here to learn the essentials of this versatile tool. It’s now a little more than six months since Kate’s surgery, and she’s doing pretty well. Her progress has not been uniform. We haven’t messed with the steroid dose, so there has been no significant backsliding, but at the moment the aphasia, weakness, wobbliness, and lack of stamina are a bit worse than last week — though not nearly as bad as they were in the first couple of months after surgery. She’s just slow, and tires easily, and sometimes has trouble finding words. We think that what we’re seeing now is likely fatigue from last week’s chemo (the fourth of six planned monthly rounds). She hasn’t had any serious chemo side effects, but the fatigue is definitely there and tends to hit hardest in the week after the dose. But life is more than just a litany of symptoms. We attended the annual gay square dance convention in St. Louis over Memorial Day weekend, and that was good. Kate wasn’t able to dance, but I did, and we hung out with our friends and had many fine meals. (Our food karma was surprisingly good, given how unprepossessing the neighborhood around the hotel was; I’m very glad we decided to rent a car.) Kate has been industrious about decluttering the house, clearing out all kinds of old sheets, clothes, books, and papers, and has been reading a lot. We’ve also seen some movies and some excellent local theatre, including THE LION and THREE DAYS OF RAIN at Portland Center Stage (both are still playing and are recommended!). As for me, I traveled to Southern California for a week to record another couple of courses for Lynda.com, one on the “sed” text processing language and the other on the Mailman mailing list manager; those will go live in June. I’ve been plugging away on the sequel to ARABELLA OF MARS — the draft stands at nearly 50,000 words now, out of a planned 90,000 — and beginning to lay plans for the release of book 1 in June 2016. One thing I need to do right now is solicit blurbs for the cover. Whose endorsement would make you more likely to pick up a science fiction book with a historical setting? The bottom line is that things are generally not too bad, though emotionally we are both occasionally down. One thing we need to do more of is to get together with friends. In the first few months we had house guests and visitors galore, but lately it’s been just us more often than not, and that can be kind of isolating. So if you can come by for a chat, or join us for a meal, or go out for a walk in the park, or anything like that, please drop me a line and see if we can find a time that works for everyone. If you’re not local, a card, letter, email, or phone call would be welcome too. Thanks to Mary Kay for helping Kate while I was in California, and to Amanda, who helped Kate when I took a brief respite trip to Seattle. We also got visits from Zoe and Patty, Debbie and Alan (who brought a delicious casserole), Ariel, Mark, and probably others I’m forgetting, and moral support from Janna, Greg, Mary, Shannon, and many others. Thank you so much for your continued support. The Lion at Portland Center Stage is a very powerful one-man musical — or long autobiographical essay told largely in song — about a thirtysomething songwriter who’s survived a hell of a lot in his short life. It was very good and full of surprises and emotionally draining and yet managed to pack in a lot of laughs. If it’s coming to your area, I recommend it. It’s been kind of two steps forward, one step back this month. Kate woke up one morning with chest pains and we went to the emergency room. They kept her in the hospital overnight for observation; it turned out not to be a heart attack, but was still a stressful and exhausting experience. We also tried reducing the steroid dose again, and again this resulted in a return of the aphasia and other symptoms so we went back to the previous dose. She’s much better now, but after all that I feel that we’re basically back where we were at this time last month. We won’t be trying that again any time soon, unless there’s some solid evidence that she doesn’t need the higher dose any more. We did get another MRI this month. We were both pretty nervous about the results, but when we saw the scan it was were pretty much the same as the last one, with some improvements. The areas of “enhancement” are a bit smaller, one of the spots went away completely, and there’s no indication of increased blood flow (associated with tumor growth). This is good news. Also good news: we took a trip to Las Vegas, which went well. We saw three shows, ate many excellent meals, visited the Mob Museum, and goggled at the architecture. We did not gamble at all. It was a pretty laid-back trip by our usual standards, but we were exhausted when we came home; I’m really not sure whether or not we will be up for the square dance convention in late May. We’ll play it by ear based on our energy levels. All in all, Kate is generally doing well. She can’t drive and can’t walk very far or very fast, but she’s been cooking and today she even took a trip on the bus while I was at yoga class. We hope for continued improvement in the months to come. If you can come by for a visit or send a card or some cookies, please do so. As you may recall, I had a small spot removed from my nose two weeks ago. Well, I got a phone call from the dermatologist’s office yesterday, saying only “call us.” Unfortunately, I didn’t get the message until after the office was closed. As you might guess, I didn’t sleep well. At all. The news, when I finally got it this morning, was not what I’d hoped to hear but not nearly as bad as I’d feared. The spot is an “in-situ squamous cell carcinoma,” in other words a type of skin cancer. But it is not malignant, and is easily treatable: it’s a 15-minute procedure in the doctor’s office, with a 98% cure rate. Basically they just “scrape and burn” until they find healthy tissue. This a very common procedure; one in five people gets skin cancer at some point in their lives. So, all in all, not too bad. But, seriously, this can stop any time. Hug the people you love. And wear sunscreen. It’s tough for the doctors to tell what the cause of the pain actually was, but it was likely heartburn from the steroids. Kate was already taking an anti-heartburn med (Pepcid) for that, but we got a prescription for a stronger one (Prilosec). We will also be seeing our regular doctor on Friday to follow up. Hospitals make you “sick.” By which I mean that the simple fact of being in the hospital takes away your agency and turns you into a “sick person,” an object. Your clothes are stripped away and you are given a stupid gown that does almost nothing to protect your privacy or dignity. You sleep, eat, and drink on someone else’s schedule, and none of it well. You are forced into a horizontal position in which everyone literally looks down on you. You are poked with needles, given drugs which often make you feel worse, and forced into inactivity even if movement and exercise might make you feel better. It’s all done out of kindness and for the best of reasons, but the whole thing seems engineered to make you powerless and miserable. The whole episode was time-consuming, anxiety-inducing, and exhausting, but at least it won’t cost us anything in cash — we’ve already hit our “out of pocket max” for the year. In the larger scheme of things, this was just a bump in the road. Thanks very much for your support, especially Nancy, John, Dave, Merilee, Bo, Don, Janna, Mary, and Teresa, all of whom came by to keep us company and let me get away from the room when necessary. Things are going pretty well here. The last time I posted about this, we had tried reducing Kate’s steroid dose and the aphasia came roaring back, and we were just about to begin the second round of chemotherapy. The chemo — five days of pills, with a doubled daily dosage — went off with almost no side effects, and the increased steroids have worked well. She’s gone from “can barely get a full sentence out” to “some hesitation and occasional wrong words.” The steroids do carry some undesirable side effects, including facial swelling and tremor, but for now we will just have to live with them. The next round of chemo begins later this week. At the moment Kate’s biggest problems are strength, stamina, and balance. But those are all better than they were, and her mental energy and concentration are improved; she’s being all ambitious and proactive in a very encouraging way. She does have some memory issues, which may or may not improve with time. But she’s been cooking and decluttering and doing crossword puzzles and knitting (slowly) and just generally being more Kate-like. She can walk faster and farther than before, and doesn’t have to take several naps a day any more. Still not driving, though, and I don’t think she has the stamina to take the bus, so when I go out of town I still want someone in the house to help her. We both hope that won’t last forever. We have continued trying to walk a lot, exercise several times a week, and eat right. Spring is definitely here (we’re well past crocuses and daffodils and into tulips and cherry blossoms), which makes the walking easier and more fun. And Kate has started working with her trainer at the gym again, which can be exhausting and sometimes kind of discouraging but a very good forward step. We could both be exercising more than we are, but what else is new? I’ve been doing pretty well myself. Progress on the novel continues, I’ve seen some short story reprints, and I’ve been working on a novelette that I hope to be able to tell you more about soon. I’ve been doing weekly yoga and got a couple of days out of town on my own. I also got a small spot removed from my nose (“It’s probably nothing, but let’s take it off and have it analyzed”) and finally got a clean bill of health on my lungs, which we’ve been watching for possible sarcoidosis for the last year and a half. Thanks to Janna, Andi, Dave, Will, Brenda, Ariel, and John (and possibly others I’ve forgotten), all of whom came by for a short or long visit. It’s greatly appreciated, because we haven’t been able to go to a convention or square dance for months. However, we are trying to get back to dancing (we’ll see how that goes) and will visit Las Vegas in late April. This trip is a bit of an experiment, which will help us figure out what we can and can’t expect to be able to do on future trips. In May I will fly to Southern California for a week to record some more technical training videos for lynda.com, and we hope to attend the annual square dance convention in St. Louis. After that, who knows? Thanks for your visits and cards and letters and emails. This is a marathon, and your cheers help keep us going.